Win Free Home Renovation worth $30,000! Simply sign up an interior package with any of HomeRenoGuru.sg participating interior design firms to qualify. 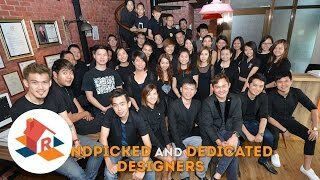 A true pioneer in the home renovations industry, Carpenters Design Group traces its origins back to 1950, when its parent company, Ban Yew, was set up in Malaysia. It moved to Singapore in 1976 and rapidly expanded to meet market demands. From specialising in pure carpentry works, it upgraded its services to encompass whole house renovations. Not surprisingly, given its origins in carpentry, Carpenters Design Group places a strong emphasis on quality workmanship and materials. It uses only solid plywood in its carpentry works, rejecting cheaper substitutes such as particleboard and MDF. Similarly, it uses only high-pressure laminates as finishes. In fact, the company uses only the best products in any given category, as attested by its working partners, Blum and Nippon Paint. The former is a global market leader in the category of functional furniture fittings such as soft-closing hinges and silent drawer runner tracks. The latter, Singapore’s market-leading brand of paint, needs no introduction. Carpenters Design Group has all the tools to build your dream home, rooted in the realities of your budget and space. All information is correct at time of printing, but maybe subject to change.